Eng, C. C., Ibrahim, N. A., Zainuddin, N., Ariffin, H., and Wan Yunus, W. M. Z. (2016). "Chemical modification of oil palm mesocarp fiber by methacrylate silane: Effects on morphology, mechanical, and dynamic mechanical properties of biodegradable hybrid composites," BioRes. 11(1), 861-872. Effects of modifying oil palm mesocarp fibers (OPMF) by methacrylate silane on polylactic acid (PLA)/ polycaprolactone (PCL)/clay/OPMF hybrid composites were investigated. The composites were prepared by a melt blending technique and characterized by dynamic mechanical analysis (DMA) and scanning electron microscopy (SEM). The silane-treated OPMF hybrid composites showed better tensile strength, tensile modulus, and elongation at break than unmodified OPMF hybrid composites. DMA analysis showed an increase in storage modulus when silane-treated OPMF was added to a hybrid composite. 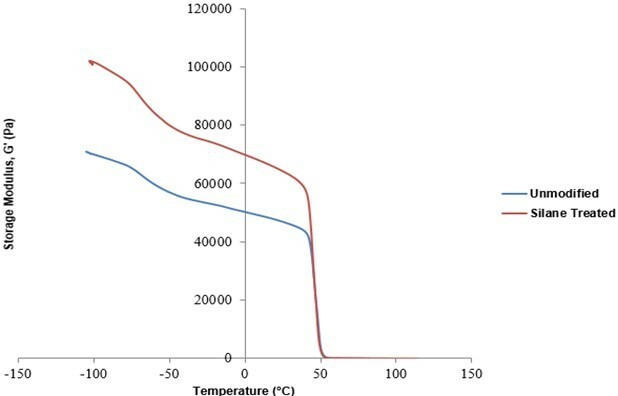 The loss modulus curve showed that the incorporation of silane-treated OPMF into a hybrid composite shifted the two glass transition temperatures (Tg) of composites closer to each other. The low tan δ peak indicated good fiber/matrix adhesion for the silane-treated OPMF hybrid composites. SEM micrographs revealed that silane-treated OPMF hybrid composites showed better fiber/matrix adhesion than unmodified OPMF hybrid composites because of absence of gap between silane-treated OPMF and the matrix in the composite. The oil palm (Elaeis guineensis) originates from South Africa, grows well in all tropical areas of the world, and has become one of the main industrial crops of Malaysia. The Malaysian palm oil industry has grown tremendously over the last 25 years and has become the world’s leading producer and exporter of palm oil (Mohammed et al. 2011). For every kg of palm oil produced, approximately 4 kg of dry biomass is produced, excluding palm oil mill effluent (POME). In 2010, the amount of oil palm mesocarp fiber (OPMF) available was 10.80 Mt/year (Ng et al. 2012). Therefore, there are huge amounts of fibers that can be utilized instead of being discarded as waste. Traditionally, the mesocarp fiber is mixed with kernel shell and utilized as solid fuel to generate electricity for the mill. Lately, our research group has successfully fabricated OPMF with biodegradable thermoplastics of polybutylene succinate (PBS) (Then et al. 2013) or PLA/PCL blends (Eng et al. 2014a) to produce biodegradable composites. Natural fibers as reinforcement filler in polymer composites have received increasing attention from researchers because natural fibers have many significant advantages over synthetic fibers. They are environmentally friendly, fully biodegradable, renewable, cheap, and have low density (Wambua et al. 2003). However, there are also some disadvantages, such as poor wettability, incompatibility with some polymeric matrices, and high moisture adsorption, which restrict their usage in polymer composites (Riccieri et al. 1999). Therefore, modification is needed to improve fiber/matrix adhesion. Recently, modification of OPMF by superheated steam (Nordin et al. 2013), alkaline peroxide (Then et al. 2015), or silane coupling agents (Eng et al. 2014b) was successfully conducted by our research group. Huda et al. (2008) modified kenaf fibers using alkalization and silane treatments and then blended them with polylactic acid (PLA). 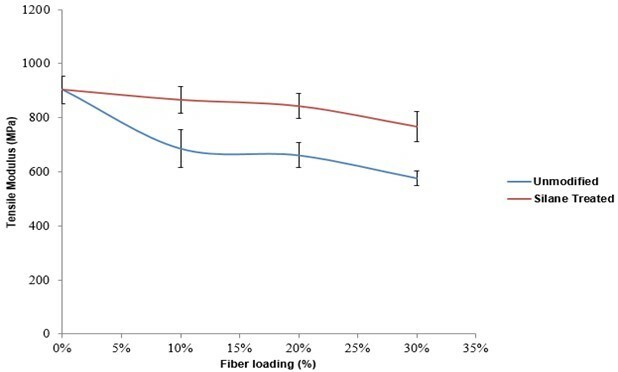 It was found that both silane-treated fiber-reinforced composites and alkali-treated fiber-reinforced composites offered superior mechanical properties compared to untreated fiber-reinforced composites. Sever et al. (2010) treated jute fabrics with various concentrations of γ-methacryloxy-propyl-trimethoxy-silane. Jute/polyester composites were fabricated and tensile, flexural, and interlaminar shear strength properties were studied. The results for 0.3% silane-treated composites revealed approximately 40%, 30%, and 55% improvement in tensile, flexural, and interlaminar shear strength, respectively. SEM micrographs showed good adhesion between the treated fibers and polyester. Polylactic acid (PLA) is a biodegradable polymer with good mechanical properties, thermal plasticity, and biocompatibility. However, PLA is a comparatively brittle and stiff polymer with low deformation at break. Therefore, modification of PLA is needed to compete with flexible polymers such as polypropylene (PP) or polyethylene (PE) (Balakrishnan et al. 2010). Polycaprolactone (PCL) is a flexible, semi-crystalline, biodegradable polymer with a low melting point and exceptional blend-compatibility. High-flexibility PCL can be considered as a more suitable plasticizer for PLA compared to low-molecular weight plasticizers because it does not migrate to the surface of the blended samples and the physical properties cannot be degraded (Yeh et al. 2009). Although biodegradable polymers have a wide range of mechanical properties and degradation rates, inappropriate stiffness or degradation rates limit their applications (Vieira et al. 2011). Besides, biodegradable polymers are not preferred in the conventional of plastic industry due to relatively expensive of price, which restriction applications of these polymers. Therefore, incorporation of cheap natural fibers as reinforcement filler into biodegradable polymers is an alternative to reduce their cost. Clay minerals are characterized as a layer structure with one dimension in the nanometer range; the thickness of the 1:1 layer is about 0.7 nm, while the 2:1 layer is about 1 nm (Afzali et al. 2010). Clays are naturally existing aluminium silicate, principally consisting of fine-grained minerals with the natural structure of sheet-like geometry. The sheet-structured hydrous silicates are commonly known as phyllosilicates (Garrido-Ramírez et al. 2010). Clay can provide notable enhancement relative to unfilled polymer properties such as increased moduli, increased strength, increased thermal resistance, decreased gas permeability, decreased flammability, and enhanced biodegradability of biodegradable polymers (Sinha Ray and Okamoto 2003). In the authors’ previous study (Eng et al. 2014b), OPMF was successfully modified with methacrylate silane. 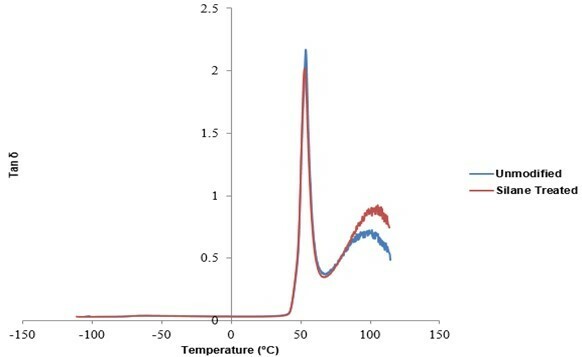 Fourier-transform infrared (FTIR) spectra showed that silane-treated OPMF became less hydrophilic. In addition, TGA analysis showed that silane-treated OPMF had higher thermal stability than unmodified OPMF. SEM micrographs revealed that silane-treated OPMF surfaces became more rough and porous than unmodified OPMF, providing evidence that OPMF were successfully modified. The major goal of the modification of OPMF is to produce a suitable, cheap, and compatible OPMF-based reinforcement filler for an inexpensive biodegradable polymer matrix. The modified OPMF are expected to improve the fiber/matrix adhesion between modified fiber and polymer matrices, which will eventually produce a composite with reasonably good strength and properties that are comparable with some conventional plastics while at the same time lowering the cost of biodegradable polymers. Therefore, the objective of this paper is to investigate the effect of the incorporation of silane-treated OPMF on the morphology and mechanical and dynamic mechanical properties of PLA/PCL/clay/OPMF hybrid composites using a melt blending technique. Various characterization techniques, such as scanning electron microscopy (SEM) and dynamic mechanical analysis (DMA), were used to study the effects of the incorporation of chemical-modified OPMF on the properties of PLA/PCL/clay/OPMF hybrid composites. All reactions were carried out using reagent-grade chemicals (greater than 98% purity) without further purification. Raw oil palm mesocarp fibers (OPMF) were obtained from Felda Palm Ind., Sdn Bhd., Serting Hilir, Negeri Sembilan. Also, 3-(trimethoxysilyl) propyl methacrylate was supplied from Acros Organic (USA). The raw OPMF were soaked in distilled water for 24 h to remove impurities. They were then rinsed with hot water (60 °C) twice and finally with acetone to remove wax prior to drying at 60 °C in an air oven. The fibers were ground and sieved to a particle size of 150 mm using a crusher machine. Modification of OPMF by methacrylate silane was described in a previous paper (Eng et al. 2014b). Briefly, 5 wt.% silane (weight percentage compared to OPMF) was dissolved for hydrolysis in a mixture of a 3:2 ratio of ethanol and water. The pH of the solution was adjusted to 4 with acetic acid as rate of acid hydrolysis is significantly greater than basic hydrolysis (Arkles et al. 1992). The mixture was stirred continuously for 1 h. Then, unbleached or bleached OPMF were soaked in the solution for 3 h and dried at 60 °C in an air oven overnight. The composites were prepared by a melt blending technique in which the contents of PLA and PCL were kept constant at 85 wt.% and 15 wt.%, respectively, in the blend, while the clay content was kept constant at 1 wt.% of the total polymer content (PLA/PCL), which was the optimum composition in a previous study (Eng et al. 2014c). Only the content of OPMF was varied, from 0% to 30%. The formulations are shown in Table 1. PLA, PCL, nanoclay, and OPMF were manually premixed in a container and fed into a Brabender Plastograph EC (Germany) at 170 °C with a rotor speed of 50 rpm for 10 min. The products were then compression molded into sheets of 1-mm thickness using an electrically heated hydraulic press with a force of 1500 kN at 160 °C for 10 min. The sample sheets were then used for further characterization. Tensile properties were measured with an Instron machine model 4301 (USA) with a grip attachment distance of 45 mm. A load of 1.0 kN was applied at a constant crosshead speed of 5 mm min-1. Test specimens were prepared and stamped in accordance with ASTM D638-5 (2000) dumbbell parameters. Sample thickness was measured with a Mitutoyo Digimatic indicator, type IDF-112 (Japan), with a measuring accuracy of ± 0.001 mm. The surface morphology of fracture surface obtained from plain strain fracture tensile tested specimen was observed with a scanning electron microscope (JEOL JSM-6400, Japan) after the samples were sputter-coated with gold using a Bio-rad (USA) coating system. A Perkin Elmer model Pyris Diamond DMA (USA) was used. Samples were tested under a static force of 10 N and a dynamic force of 8 N, with 1-Hz frequencies. Scanning was done from -100 to 130 °C at a 2 °C/min rate; sample dimensions were 1 mm in thickness and 30 mm in length, and the bending mode was used. The tensile strengths of unmodified and silane-treated OPMF in hybrid composites are illustrated in Fig. 1. 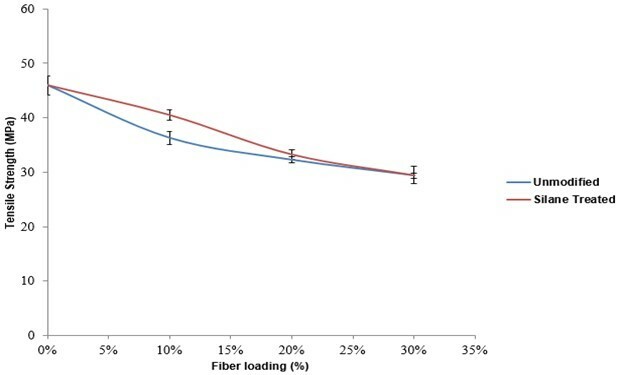 The silane-treated OPMF hybrid composites (40.45 MPa) showed 11.37% higher tensile strength than unmodified OPMF composites (36.32 MPa) at 10% fiber loading, which then decreased as the amount of fibers increased. All composites showed a similar trend, which might be due to poor dispersion of the filler caused by the agglomeration of OPMF throughout the composites, leading to lower stress transfer in the composites. Unmodified OPMF acted as filler in the resin matrix, which actually weakened the composite because of the poor interfacial adhesion, obstructed the stress propagation, and caused the tensile strength to decrease as the filler loading increased (Yang et al. 2006). On the other hand, the incorporation of more hydrophobic silane-treated OPMF led to better tensile strength because the modified fibers were more hydrophobic than the unmodified OPMF, as shown in the FTIR spectra of our previous study (Eng et al. 2014b). An increase in hydrophobicity of fibers enhanced the compatibility between fibers and matrix, which increased the strength, stiffness, and interfacial adhesion of composites (Abdul Khalil et al. 2007). Figure 2 shows the tensile modulus of unmodified and silane-treated OPMF in hybrid composites. The tensile modulus indicates the stiffness of materials. All composites showed the highest tensile modulus at 10% fiber loading, which was 865.50 and 685.80 MPa for silane-treated and unmodified OPMF composites, respectively. Silane-treated OPMF composites showed 26.20% higher tensile modulus than unmodified OPMF composites, which might be due to the incorporation of more hydrophobic silane-treated OPMF, imparting stiffness to the composite. Additionally, improvement of the silane-treated OPMF/matrix adhesion provided better stress transfer in composites, which contributed to a higher tensile modulus. However, the tensile modulus decreased with increasing fiber loading, which might be due to agglomeration of the filler in composites, causing lower stress transfer in the composites. Elongation at break of unmodified and silane-treated OPMF in hybrid composites are shown in Fig. 3. Silane-treated OPMF composites showed higher elongation at break (0.95 mm) than unmodified OPMF composites (0.74 mm) at 10% fiber loading, which indicated that the incorporation of more hydrophobic silane-treated OPMF, which is more compatible with the hydrophobic polymer matrix, resulted in better fiber/matrix adhesion. Enhancement of fiber/matrix adhesion in composites will result in the improvement of the tensile properties of composites. However, the further addition of fiber reduced the elongation at break of composites because the incorporation of fibers into the matrix causes composites to become stiffer and harder as the segment mobility of the composites is reduced (Flink et al. 1988). In addition, higher amounts of fibers tend to agglomerate throughout composites, which resulted in lower elongation at break as lower stress transfer occurs in the composites. The storage modulus (G’) of unmodified and silane-treated OPMF in hybrid composites is illustrated in Fig. 4. Silane-treated OPMF composites showed higher storage moduli than unmodified OPMF composites. The G’ results showed agreement with the tensile modulus results, as silane-treated OPMF hybrid composites showed the highest tensile modulus. 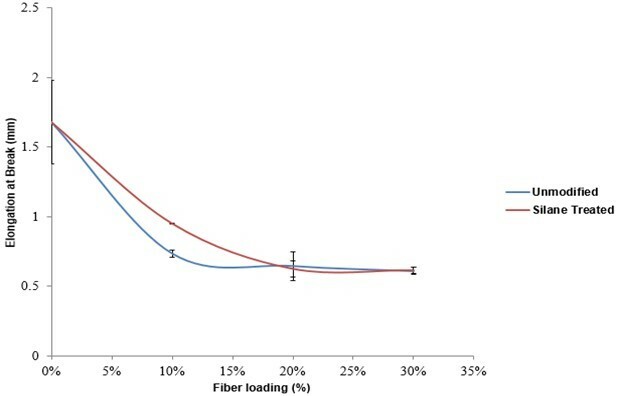 The value of the storage modulus decreased at higher temperatures because of the loss of stiffness in the fibers (Shanmugam and Thiruchitrambalam 2013). The improvement of the G’ of silane-treated OPMF composites was due to greater interfacial adhesion and bond strength between the matrix and fibers. Furthermore, the addition of treated fibers imparted stiffness to the composites, which contributed to the higher storage modulus of silane-treated OPMF hybrid composites (Vilay et al. 2008). The loss modulus (G’’) of unmodified and silane-treated OPMF in hybrid composites is shown in Fig. 5. The loss modulus indicates the material’s ability to dissipate energy in the form of heat or molecular rearrangement during the deformation (Rezaei et al. 2009). G’’ accounts for the viscous component of the complex modulus or the out of phase component with the applied strain, which normally increases with the addition of filler (Singh et al. 2010). 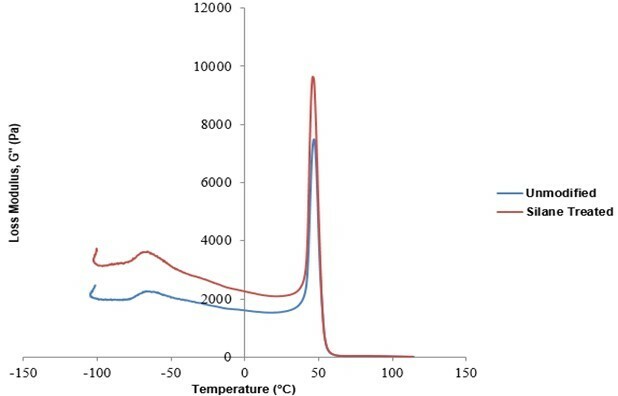 The results showed that the addition of silane-treated OPMF into composites shifted the Tg of composites from -67.0 to -66.2 °C in the PCL region and from 46.5 to 46.0 °C in the PLA region. Shifting of the glass transition temperature (Tg) occurs because of improvements in the fiber/matrix interaction. The effect of shifting depends on the fiber/matrix bond strength because strong bonding is essential for the activation of the fiber constraint during the stress transfer mechanism at the interface, while weak bonding results in energy dissipation at the interface (Pothan et al. 2006). The loss factor (tan δ) of unmodified and silane-treated OPMF in hybrid composites is illustrated in Fig. 6. The area underneath the tan δ peak indicates the damping ability of materials. Damping in the transition zone measures the imperfection in the elasticity, and energy used to deform a material during DMA testing is dissipated directly into heat (Liu et al. 2005). Silane-treated OPMF composites showed lower damping than unmodified OPMF composites. As the damping at the interface increases, the interfacial adhesion between fibers and matrix becomes weaker (Dong and Gauvin 1993). Tan δ results indicated that silane-treated OPMF formed good interfacial adhesion with the matrix in hybrid composites, as composites with strong interfacial bonding tend to dissipate less energy compared with composites with poor interfacial bonding. Scanning electron micrographs of the fractured surface of unmodified and silane-treated OPMF in hybrid composites are shown in Fig. 7 at a magnification of 500X. The red arrow in Fig. 7(a) indicates a gap between unmodified OPMF and the polymer matrix. This gap indicates weak fiber/matrix adhesion between hydrophilic fibers and hydrophobic matrix. 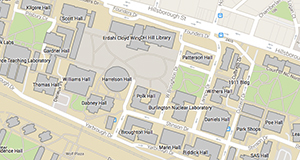 However, the red arrow in Fig. 7(b) shows good fiber/matrix adhesion in silane-treated OPMF composites, as there was no gap between the more hydrophobic silane-treated OPMF and the matrix. In a previous study (Eng et al. 2014b), SEM micrographs revealed that silane-treated OPMF surfaces became more rough and porous than unmodified OPMF. Surface roughness of modified fiber will contribute to better fiber/matrix adhesion, as the modified fiber can more easily bind with the matrix. Therefore, this result supports the tensile test results, in which the incorporation of silane-treated OPMF enhanced the tensile properties of composites because of the improved fiber/matrix adhesion. The incorporation of silane-treated OPMF successfully improved the tensile strength, tensile modulus, and elongation at break of PLA/PCL/clay/OPMF hybrid composites. DMA shows that incorporation of silane-treated OPMF into composites increased the storage modulus, while the loss modulus curve shows that the two Tg in composites shift and become closer to each other with the incorporation of silane-treated OPMF, which indicates better fiber/matrix adhesion between silane-treated OPMF and the matrix. In addition, the low tan δ peak proved that silane-treated OPMF possessed better fiber/matrix adhesion, as composites with strong interfacial bonding tend to dissipate less energy. SEM micrographs supported the fact that silane-treated OPMF hybrid composites showed better fiber/matrix adhesion compared to unmodified OPMF hybrid composites, as there were no gaps between silane-treated OPMF and the matrix. The authors would like to thank the Research University Grant Scheme (RUGS) of UPM for financial support. The technical staff of the Department of Chemistry, Faculty of Science, Universiti Putra Malaysia are thanked for their assistance. Article submitted: July 14, 2015; Peer review completed: November 16, 2015; Revised version received and accepted: November 19, 2015; Published: November 30, 2015.